This work aimed to study chronic renal failure (CRF) in an adenine induced rat model using light microscopic, electron microscopic examinations in addition to morphometric studies. Past studies of adenine induced rat model of CRF did not emphasize on the electron microscopic changes that accompany CRF. Long term feeding of adenine to rats produced metabolic changes resembling chronic renal failure in humans. Among the changes happened were loss of weight and accumulation of uremic toxins (urea and creatinine). The pathological findings in the kidneys revealed glomerular and tubulo-interstitial damage. In the current work, we stressed on the changes that happen in the ultra-structural level. Thirty adult male albino rats were divided into 2 groups: Group (I) ten rats, kept without any treatment, and sacrificed after 4 weeks. 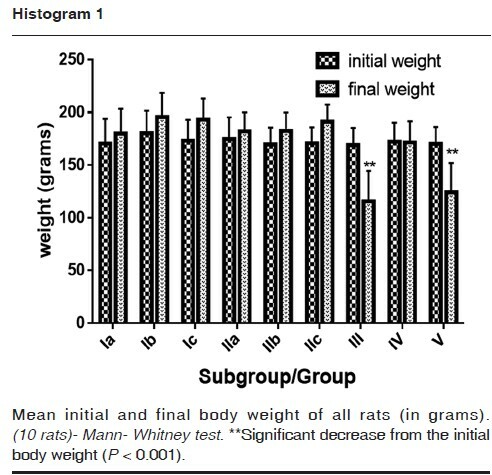 Group II (chronic renal failure induced group) twenty rats, received adenine powder daily (0.75% w/w for 4 weeks in food i.e., a daily adenine dose of 0.075 grams was added to 10 grams of food for each rat). Initial and final weights were recorded. Blood samples were collected for kidney function tests. Kidney sections were prepared for light and electron microscopic examination. Morphometric and statistical analysis were done. In comparison with the control group, the CRF induced group showed a significant decrease in their final body weight (P < 0.001), significant increase in the urea and creatinine levels (P < 0.001) and significant increase in collagen fiber surface area. Long term feeding of adenine exerted a marked inflammatory, fibrotic and apoptotic accelerating effect on both the glomeruli and the tubules. Chronic renal failure (CRF) is a global health problem; its incidence appears to be increasing. Estimates of the global burden of the diseases report that, kidney diseases are responsible for about 830 thousand deaths annually making them the 12th highest cause of death . In most of the Middle East countries, the published population based studies for the incidence and prevalence of chronic renal failure are still lacking. However, Egypt has the 2nd highest prevalence of chronic renal failure estimated by 669 patients per million populations . Animal models of renal failure are important tools to study pathophysiological events in kidney disease that allows translational studies aiming to improve management of CRF patients. A product of Sigma-Aldrich (Munich, Germany), was available in the form of white powder and was given to the rat in food at a concentration of 0.75% w/w ,, i.e., a daily adenine dose of 0.075 grams was added to 10 grams of food for each rat. A white sheet of paper was provided as bedding for each cage; any remaining food was collected and re-weighed and recorded. Group I (control) consisted of ten rats, kept without any treatment, sacrificed after 4 weeks. Group II (CRF induced) twenty rats, received adenine powder daily (0.75% w/w for 4 weeks in food) then sacrificed . Initial and final weights were recorded . Final blood samples were taken for estimation of plasma urea and creatinine levels from the retro-orbital plexus ,. A small piece of the left kidney was fixed for 24 h in 10% neutral buffered formalin then dehydrated in ascending grades of alcohol, cleared and embedded in paraffin. After deparaffinizing, the 3–5 microns thick tissue sections were cut by microtome and were subjected to: Hx and E for routine histological examination, masson trichome stain for detection of collagen fiber deposition and toluidine blue for the semi-thin sections ,. The right kidney was cut into transverse sections 2–4 mm in diameter. Ultrathin (70–80 nm) sections were stained with lead citrate and uranyl acetate  and were mounted in formvar-coated nickel grids then inspected and photographed with JEOL JEM-1230 electron microscope at Faculty of Science, Menoufia University. Ten different H and E and Masson's Trichome stained sections from ten different rats were examined in each group for the percentage of collagen fiber surface area (area stained blue) within the glomerulus, in the parietal layer of the Bowman's capsule and the peritubular area) . Morphometric study was also done for assessment of the diameters of the renal corpuscle, the glomerulus and the Bowman's space. The data were obtained using image analyzer software, Image J analyzer version 1.43o8, National Institutes of Health, USA and Digimizer version 4.3.5, MedCalc software. This was done in Anatomy and Embryology Department, Menoufia University. Statistical Analysis was performed for the initial and final weights, final plasma urea and creatinine and for the morphometric results. Results were collected, tabulated and statistically analyzed by statistical package for social science (SPSS) version 20 on IBM compatible computer. Results were expressed as mean (x) ± standard deviation (SD). Analysis of variance (ANOVA) test for significance followed by Mann- Whitney test . A value of P < 0.05 was considered significant. 6 rats were used for each. Comparing with control group, animals of chronic renal failure (CRF) induced group (Group II) showed marked decrease in their physical activity, decreased food intake and excessive wetting of the wood shaving. The manifestations started from the second week of the experiment and deteriorated till the fourth week. [Table 1] and [Histogram 1] shows the body weight changes among the studied groups. The CRF induced group showed significant (P < 0.001) decrease in their final body weight when compared to their initial ones. [Table 2] shows the kidney function tests result among the studied groups. When compared to the control group, CRF induced group showed significant (P < 0.001) increase in their final plasma urea and creatinine levels. Control group: The renal tissue consisted of an outer cortex and an inner medulla under a thin renal capsule. The renal cortex was formed of sparse globular masses; the renal corpuscles and different size renal tubules. The medulla consisted of only collecting tubules with thin wall and wide lumen. The renal corpuscles consisted of globular lobulated capillary tuft; the glomerulus which projected into the glomerular capsule (Bowman's capsule). The outer layer of the capsule surrounded the glomerulus as the parietal layer (capsular epithelium), which then reflected into the glomerular capillaries as visceral layer of the Bowman's capsule (glomerular epithelium). The two layers were separated by the capsular space (Bowman's space). The parietal layer consisted of flat cells of simple squamous epithelium with flattened nuclei. The visceral layer consisted of the visceral epithelial cells, the podocytes. 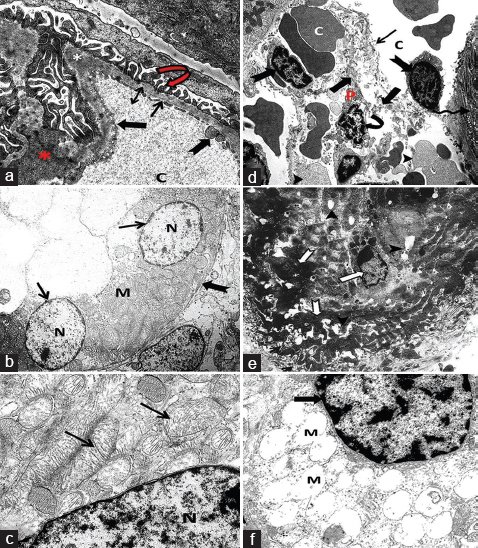 Masson Trichome stained kidney sections showed minimal amount of collagen fiber deposition under the capsule, in the renal corpuscles mainly within the glomerular basement membrane, parietal layer of the Bowman's capsule and in between the renal tubules [Figure 1],[Figure 2],[Figure 3]. 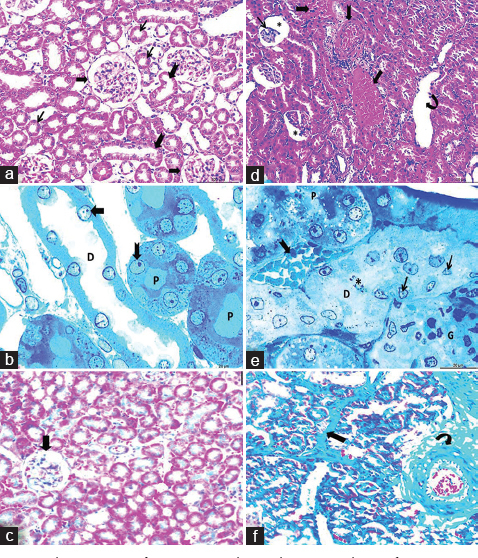 Figure 1: Photomicrographs of H and E stained kidney sections of the control group (a-c) and of the CRF induced group (d-f): (a)- The renal tissue consisting of an outer dense region which appears dark and granular, the cortex (c), it lies beneath the renal capsule (arrow) and an inner pale region, the medulla (m) (H and E, x40). (b)The renal cortex (c) which shows sparse globular masses, the renal corpuscles (arrows) and different sizes of renal tubules (arrow heads). The medulla (m) consists of collecting tubules with thin wall and wide lumen (notched arrow) (H and E, x100). (c)- The renal corpuscles (thick arrows) and renal tubules of two shapes, rounded (thin arrows) and elongated ones (notched arrows) (H and E, x200). (d)The renal cortex with distorted architecture. Diffuse empty spaces can be seen (thin arrows). Accumulation of peritubular inflammatory cells can be observed (thick arrows). Notice: the medulla with dilated collecting tubules (asterisk) (H and E, x40). (e)- The renal cortex with extensive areas of hemorrhage (thick arrows). Thick wall congested blood vessel can be noticed (notched arrow). Hyalinization of the renal tubules can be seen (thin arrows) (H and E, x100). (f)Shrunken and condensed glomerular capillary tuft (thin arrow) with widening of the Bowman's space (asterisks). A DCT appears extensively dilated with compression and thing of its wall (curved arrow). Notice: the hyalinization of the renal tubules most likely the PCTs (thick arrows) and the thick wall congested blood vessel (notched arrow). (H and E, x200). 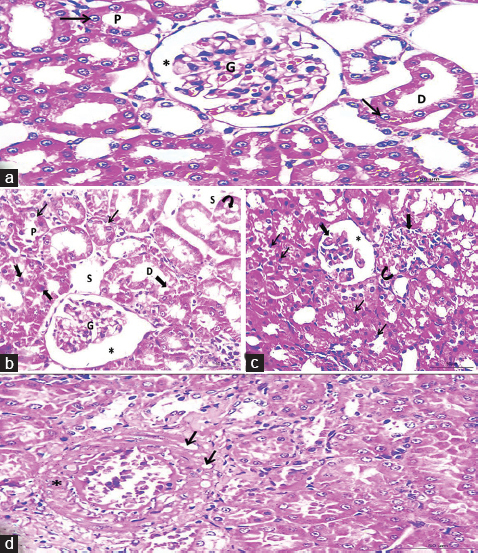 Figure 2: Photomicrographs of H and E stained kidney sections of the control group (a) and of the CRF induced group (b-d): (a)- The renal corpuscle consisting of the glomerulus (g) which projects into the Bowman's capsule which has two layers, outer parietal layer (thick arrow) and inner visceral one (thin arrow) separated by a capsular space or Bowman's space (asterisk). The proximal convoluted tubules PCTs (p) are lined with cuboidal epithelium with acidophilic cytoplasm (arrow). The distal convoluted tubules DCTs (d) are lined with columnar epithelium with less acidophilic cytoplasm (arrow) (H and E, x400). (b)- A renal corpuscle with abnormal shaped glomerulus (g). Its Bowman's space is abnormally dilated (asterisk). The PCTs (p) show vacuolated cytoplasm of their lining cells (thin arrow). The DCTs (d) show evident cell lysis (thick arrow). Cells of both tubules show pyknotic nuclei (notched arrows). Widened interstitial spaces can be noticed (s). Intraluminal cast can be seen (curved arrow) (H and E, x400). (c)- Two adjacent renal corpuscles, one of them has a dilated Bowman's space (asterisk) and destructed glomerulus (notched arrow), while the other shows complete obliteration of its Bowman's space (thick arrow) and dilated glomerulus (curved arrow). The surrounding renal tubules show pyknotic nuclei of their lining epithelial cells (thin arrows) (H and E, x400). (d)- Thick wall congested dilated blood vessel (asterisk) with vacuolation of its smooth muscle wall (thin arrows) (H and E, x400). Figure 3: Photomicrographs of Masson Trichome stained kidney sections of the control group (a) and of the CRF induced group (b) and Toluidine blue stained sections of the control group (c) and of the CRF group (d and e): (a)- Minimal amount of collagen fiber deposition in the parietal layer of the Bowman's capsule (arrow) (Masson Trichome x200). (b)- Large amount of collagen fiber deposition in between the tubules (arrows) and within the glomerulus (asterisk) (Masson Trichome x200). (c)- The lining epithelial cells of the PCTs (p) with a rounded vesicular nucleus (notched arrow). One distal convoluted tubule can be seen (d), its lining epithelium shows apical light cytoplasm. Their nuclei appear rounded and vesicular (thick arrow) (Toluidine blue x1000). (d)- A distal tubule (d) shows shrunken nuclei of its lining epithelial cells with irregular nuclear membrane (thin arrows). Its lumen shows extruded cell debris (asterisk). Notice the area of hemorrhage in between the DCT and the neighboring PCT (notched arrow) (Toluidine blue x1000). (e)- A proximal convoluted tubules (p) with a neighboring glomerulus (g). The nuclei of their lining epithelium are shrunken with irregular nuclear envelop (notched arrows). Increased number of lysosomes is evident (thin arrows). Notice the extruded cell debris into the lumen (thick arrow) (Toluidine blue x1000). Chronic renal failure induced group: H and E stained kidney sections revealed major pathological changes affected mainly the renal cortex with minimal affection of the renal medulla. Distorted architecture of the renal cortex with multiple diffuse empty spaces within it was clearly noticed. Also, accumulated peritubular inflammatory cells areas of extensive hemorrhage could be seen in the cortex. Thick wall congested dilated blood vessels with vacuolation of their smooth muscle wall could be seen. The renal cortex showed distorted renal corpuscles. Some corpuscles showed condensation, shrinkage with widening of their Bowman's space, while others showed complete obliteration of their Bowman's space. The lining epithelial cells of both proximal and distal convoluted tubules showed degenerative changes in the form of vacuolated cytoplasm (hydropic degeneration). Extruded cell debris into the tubular lumen and intraluminal cast were evident. Masson Trichome stained kidney sections showed extremely large amount of collagen fiber deposition beneath the capsule, large amount in the renal corpuscles mainly within the glomerular basement membrane, parietal layer of the Bowman's capsule, (capsular epithelium), large amount in between the renal tubules and huge amount within the wall of blood vessels which appeared as tense blue color [Figure 1],[Figure 2],[Figure 3]. Control group: Podocytes had several cytoplasmic extensions (the primary processes) and numerous organelles, these processes wrapped around the glomerular capillaries giving rise to numerous secondary foot processes called pedicles. The lining endothelium was fenestrated. The proximal convoluted tubules had large oval or rounded euchromatic nucleus with peripheral heterochromatic nucleolus. Basally located closely packed numerous mitochondria could be noticed. They were of two shapes, elongated (rod shaped) mitochondria and rounded ones. Long closely packed apical microvilli projecting into the lumen forming a brush border could be seen. The distal convoluted tubule rested on an even basal lamina with unremarkable basal infoldings or striations (notched arrow). Their mitochondria appeared elongated and parallel to each other and to the longitudinal axis of the cell. The mitochondrial lamellar cristae could be clearly noticed. The nucleus appeared large, oval or rounded and euchromatic with central hyperchromatic nucleolus [Figure 4] and [Figure 5]. 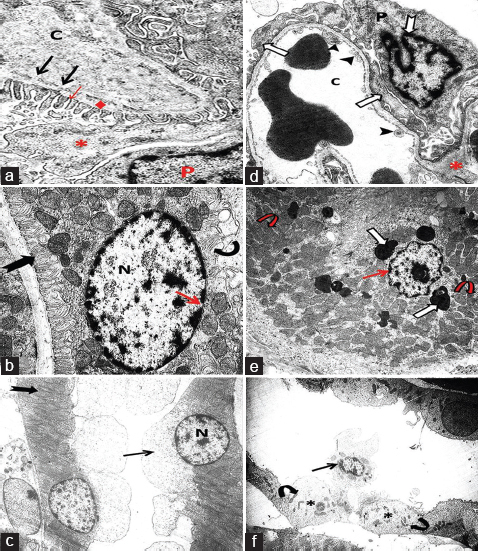 Figure 4: Electron micrographs of kidney sections (a-c) of control group, (d-f) of CRF group: (a)- A podocyte (p) wrapping around a glomerular capillary (c) with its secondary foot processes (pedicles) having filtration slits (slit pores) in between (red arrow). The pedicles envelop the capillary basement membrane (diamond) which is lined with fenestrated endothelium (black arrows). Notice, the primary foot processes (asterisk). (x15000). (b)- A cell of a proximal convoluted tubule resting on an even basal lamina with well-developed basal infoldings (basal striations) can be noticed (notched arrow). A supra-nuclear Golgi complex can be seen (curved arrow). Notice the large oval euchromatic nucleus (n) that is surrounded by the nuclear membrane which has nuclear pores (red arrow) (x12000). (c)- Part of a cell lining the proximal convoluted tubules. The mitochondria of both shapes show lamellar cristae and mildly dense matrix (arrows). Notice: part of the euchromatic nucleus (n). (x15000). (d)- A podocyte enveloping a glomerular capillary (c). The podocyte shows fusion and effacement of its secondary foot processes (arrow). Large and medium sized crystal deposition can be seen (arrows head). (x15000). (e)- Part of a cell lining the PCT with abnormally shrunken nucleus with corrugated nuclear envelop (red arrow). Huge sized lysosomes can be noticed (white arrows). The mitochondria appear small and dense (curved arrow).) (x12000). (f)- A cell of a proximal convoluted tubule with ballooning of its mitochondria and loss of their lamellar cristae (m). A part of the nucleus can be seen with increased heterochromatin (arrow). (x15000). Figure 5: Electron micrographs of kidney sections of control group (a and b), of CRF induced group (c and d): (a)- Part of a distal convoluted tubule. Its cell lining shows a nucleus (n) which is apical, oval and euchromatic with a central heterochromatic nucleolus. Apical electron-lucent cytoplasm can be noticed (thin arrow) with no microvilli. Numerous basal elongated mitochondria can be seen (notched arrow). (x5000). (b)- A cell of a distal convoluted tubule. The cell rests on an even basal lamina with unremarkable basal infoldings or striations (notched arrow). The mitochondria appear elongated and parallel to each other and perpendicular to the longitudinal axis of the cell (arrow). Notice: the euchromatic oval nucleus (n) with a central nucleolus. (x12000). (c)- A part of a distal convoluted tubule showing the lining epithelial cells with scanty organelles, the mitochondria show decreased number and size (curved arrow). The cells show loss of their nuclei (asterisks). There is an extruded cell into the tubular lumen (thin arrow) (x5000). (d)- Part of the epithelial cell lining of a distal convoluted tubule. One of its nuclei shows apoptotic changes. The nucleus is fragmented (notched red arrow). An apoptotic body can be seen including the fragmented part of the nucleus and other organelles (arrow). Another apoptotic bud is being formed (a). A ghost cell can be noticed with vanished organelles (g) (x12000). Chronic renal failure induced group: Ultra-thin sections revealed distortion and discontinuity of the primary processes of the podocyte. While the secondary foot processes (pedicles) lost their finger like projection shape and became fused together with effacement. The distal convoluted tubules showed apoptotic changes. The nuclei were fragmented with apoptotic body formation. The proximal convoluted tubules showed ballooning of its mitochondria with loss of their lamellar cristae. [Figure 4] and [Figure 5]. Comparing to the control group, the CRF induced group showed a significant increase (P < 0.001) in percentage of surface area of collagen fiber deposition. 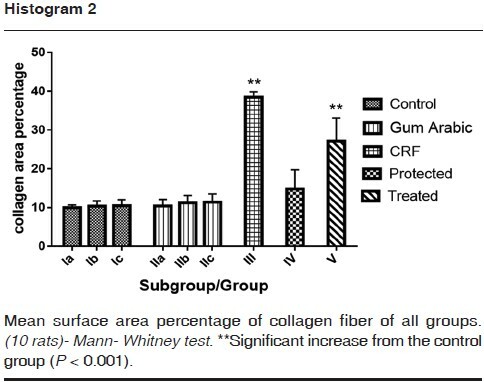 The protected group (Group IV) showed a non-significant increase (P > 0.05) in the percentage of surface area of collagen fiber deposition when compared to the control group. The treated group (Group V) showed a highly significant increase (P < 0.001) in the surface area percentage when compared to the control group [Histogram 2]. Comparing with the control group, the CRF induced group (Group II) showed a significant decrease (P < 0.05) in the diameter of the renal corpuscle (P < 0.001). The renal glomerulus showed either a significant decrease (Labeled as group III in the table) (P < 0.001) or a non-significant decrease (P > 0.05) (Labeled as group III in the table). However, Bowman's space showed a significant increase (Labeled as group III in the table) or decrease in its diameter (Labeled as group III in the table) [Table 3]. Long term feeding with adenine provides an animal model of uremia, from which, phases and various mechanisms of chronic renal failure can be assessed . who discovered that when adenine was present in excess, it became a significant substrate for xanthine dehydrogenase, which could oxidize adenine to 2, 8 dihydroxyadenine (DHA). Both adenine and DHA had very low solubility; they precipitated in the renal tubules and led to tubular occlusion. In the present study, the elevated plasma urea and creatinine levels of the CRF induced group judged the occurrence of CRF as mentioned by Peng et al. . These uremic toxins might be the cause of the significant reduction of body weight, in the CRF group, or due to loss of appetite as mentioned by Burns et al. . In the present work, two forms of mitochondrial damage were observed in PCTs of the CRF induced group. The ballooned as well as the destructed dense shrunken mitochondria, the former might be due to failure of energy (due to impaired oxidative phosphorylation) dependent ion and cation pump respectively . This might lead to accumulation of sodium with subsequent entry of water ,. The latter might be due to condensation of matrix proteins . The current study showed the presence of interstitial fibrosis, this was evidenced by the significant increase of collagen fiber deposition in the interstitium. Fibrosis might suggest the presence of chronic inflammation which was emphasized by the presence of peritubular inflammatory cells and fibroblasts. This was in accordance with Helmy et al. who added that fibroblasts secreted excess extracellular matrix and this in turn, destroyed the normal interstitial architecture of the kidney. Morover, the significant increase of collagen fiber deposition within the glomerulus indicated the occurance of glomerulosclerosis due to chronic inflammation which was emphasized by the mesangial matrix hypercellularity with overproduction of extracellular matrix. Elenkov et al. confirmed the inflammatory theory in CRF by the significant increase in lipid peroxidation end product MDA (Malondialdehyde) and C- reactive protein (CRP) inflammatory marker. In this study, intraluminal exfoliation of renal tubular epithelial cells might be due to ischemia which was also induced by oxygen free radicals . This was consistent with destruction of the apical microvilli of PCTs . The destructed microvilli might be due to lipid peroxidation and inflammation . The intraluminal casts might be due to destructed microvilli in the form of clusters or the exfoliated necrotic epithelial cells which provided the suitable matrix for cast formation. This was in agreement with Kays et al. . The present study showed an evidence of apoptosis detected in CRF induced group. Wiegele et al. attributed the apoptosis to ischemia caused by glomerulosclerosis. However, Goilav  explained that apoptosis was triggered inside the mitochondria by activation of the caspase cascade pathway. While Constantinou et al. postulated a caspase independent pathway as he found that the mitochondria released apoptosis inducing factor which triggered apoptosis resulting in subsequent tubular atrophy. The present work showed that the Bowman's space was either widened or obliterated; this indicated early and late stage of the disease consecutively widening of the capsular space might be due to shrinkage of the glomerular capillary tuft. Obliteration of the space could be due to mesangial cell hypercellularity with subsequent sclerosis . In CRF induced group, we could prove the occurrence of two forms of cell death; necrosis and apoptosis. The former was represented by shrinkage, peripheral migration of chromatin and increased heterochromatin while the latter was by nuclear fragmentation and formation of apoptotic bodies as described by Helmy et al. .
From the present study, we concluded that; chronic renal failure resulted in two forms of cell death, necrosis and apoptosis. Adenine feeding caused glomerular and tubule-interstitial damage, these changes mimic that happen with CRF in humans and this provide translational studies aiming to improve management of CRF patients. Couser WG, Remuzzi G, Mendis S. The contribution of chronic kidney disease to the global burden of major noncommunicable diseases. Kidney Int 2011; 80:1258–1270. Perico N, Remuzzi G. Chronic kidney disease: a research and public health priority. Nephrol Dial Transplant 2012; 0:1–8. Mahmoud MF, Diaai AA, Ahmed F. Evaluation of the Efficacy of Ginger, Arabic Gum and Boswellia in Acute and Chronic Renal Failure. Ren Fail 2012; 34:73–82. Ali AA, Ali KE, Fadlalla AE, Khalid KE. The Effects of Gum Arabic Oral Treatment on the Metabolic Profile of Chronic Renal Failure Patients under Regular Hemodialysis in Central Sudan. Nat Prod Res J 2008; 22:12–21. Ali BH, Beegam S, Al Lawati I, et al. Comparative Efficacy of Three Brands of Gum Acacia on Adenine-Induced Chronic Renal Failure in rats. Physiol Res J 2013; 62:47–56. Nickolas SB, Yuan J, Aminzadeh A, et al. Salutary effects of a novel oxidative stress modulator on adenine induced chronic progressive tubulointerstitial nephropathy. Am J of Trans Med 2012; 4:257–268. Van Herck H, Baumans B, Brandt CJ, et al. Blood sampling from the retro-orbital plexus, the saphenous vein and tail vein in rats: comparative effects on selected behavioral and blood variables. Lab Anim 2001; 35:131–139. Wu D, Luo N, Wang L, Zhao Z, Bu H, Xu G. Continuing Exposure to Low-Dose Nonylphenol Aggravates Adenine-Induced Chronic Renal Dysfunction and Role of Rosuvastatin Therapy. J of Trans Med 2012; 10:147. Singh D. Principles and techniques. Histology, microscopy and photography. 1st ed. New Delhi, Bangalore, India: CBS Publishers and Distributers; 2003. 679–699. Ahmed SF. The possible protective effect of vitamin C on the kidney cortex of adult female albino rat after chronic exposure to malathion: a light and electron microscopic study. The Egyptian Journal of Histology 2014; 37:402–416. Burns JT, Tankiewicz A, Pawlak D, Buczko W. Behavioral Changes in the Course of Chronic Renal Insufficiency in Rats. Pol J Pharmacol 2001; 53:263–269. Yokozawa T. Animal model of adenine induced chronic renal failure in rats. Nephron 1986; 44:230–234. Peng M, Cai P, Ma H, Meng H, Xu Y, Zhang X, Si G. Chinese herbal medicine shenqi detoxification granule inhibits fibrosis in adenine induced chronic renal failure rats. Afr J Tradit Complement Altern Med 2014; 11:194–204. Ghadially F. Ultrastructural pathology of the cell and matrix. 4th ed. butterworth-Heinemann, Boston, MA: CRC Press; 2007. 323–354. Kumar V, Abbas AK, Fausto N, Aster J. Robbins & Cortan pathologic basis of disease. 8th Ed. Philadelphia: Saunders imprint of Elsevier Inc; 2009. 510–549. Helmy AM, Sharaf-El-Din NA, Abd-El-Moneim RA, Rostom DM. Histological study of the renal cortical proximal and distal tubules in adult male albino rats following prolonged administration of titanium dioxide nanoparticles and the possible protective role of l-carnosine. 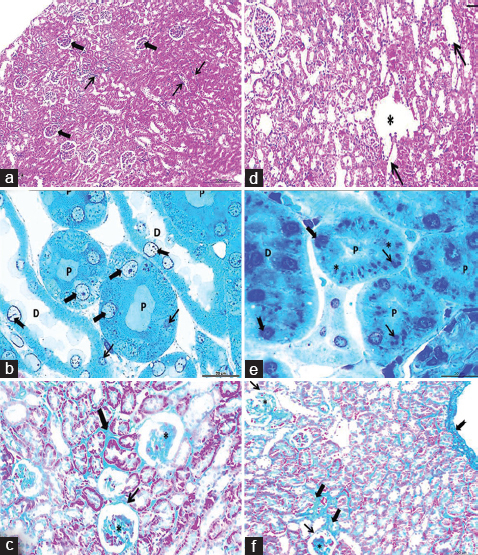 The Egyptian Journal of Histology 2015; 38:126–142. Malek, M, Nematbakhsh M. Renal ischemia/reperfusion injury; from pathophysiology to treatment. J Renal Inj Prev 2015; 4:20–27. Venkatachalam MA, Jones DB, Rennke HG, Sandstrom D, Patel Y. Mechanism of proximal tubule brush border loss and regeneration following mild renal ischemia. Lab Invest 1981; 45:355–365. Kays SE, Crowell WA, Johnson MA. Cephaloridine nephrotoxicity is potentiated by selenium deficiency but not copper deficiency in rats. J Nutr 1992; 122:1232–1241. Wiegele G, Brandis M, Zimmerhackl LB. Apoptosis and necrosis during ischemia in renal tubular cells (LLC-PK1 and MDCK). Nephrol Dial Transplant 1998; 13:1158–1167. Goilav, B. Apoptosis in polycystic kidney disease. Molecular basis of disease 2011; 1812:1272–1280. Constantinou C, Papas KA, Constantinou AL. Caspase independent pathways of programmed cell death: the unraveling of new targets of cancer therapy. Curr Cancer Drug Targets 2009; 9:717–728.